Cavy Angel’s Guinea Pig Rescue resaved a phone call on the (03/06/10) from a lady that wanted to surrender 6 of her guinea pigs. Cavy Angel’s Guinea Pig Rescue didn’t acutely have any room for the guinea pigs but manager Monique Davenport felt that the guinea pigs in her care needed help so we made room. On arrive one of the guinea pigs was in a very critical state and over all the guinea pigs looked neglected. 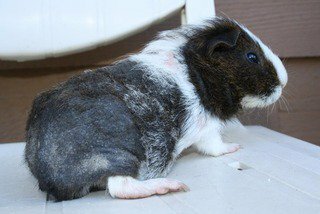 After speaking with the owner I am now 100% sure that this is not a neglect case the owner cared very much for her guinea pigs and tried with the best of her abilities to care and treat them. The lady really did care about her guinea pigs but didn’t know how to help them once she found out about us she decided it was time to get some help. 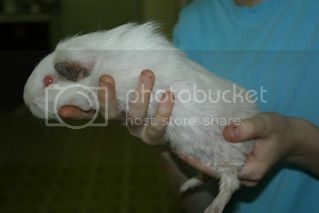 This was unfortunately a case of lack of knowledge on proper guinea pig care. The lady purchased her guinea pigs from a pet store and was provided the wrong information. The lady believed that one of the guinea pigs was bitten by a spider; this is why we named her Spider. She was very weak, dehydrated and extremely under weight. 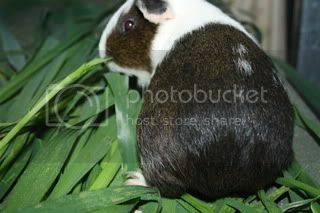 We rushed all 6 of the guinea pigs off to the vet. It turned out that Spider was not bitten by a spider but had a bad case of scurvy (Vitamin C Diffidence as well as haveing a case of mites. Spider was too weak to eat on her own so we had to syringe feed her Critical care every 2 hours as well as supplement her some extra Vitamin C.
Sadly Spider lost her fight on the 05/06/10 she was too weak and just too far gone to bring back. If you are having any problems with your guinea pigs or need advice Cavy Angel’s Guinea Pig Rescue would be more than happy to help.